Falling from a height injuries in Agriculture: a 8-year experience with 173 samples. Accepted date: March 16, 2016. Agriculture is one of the most hazardous sectors in all over the world. Although insufficient data report system, the rate of accidents in agriculture is higher than most of other industries. The most common accidents are those involving vehicles, agricultural equipment/machinery and falls from a height. During the period 2007-2014, 673 “falling from a height” accidents in Bilecik were investigated. More than a quarter of these falls are agriculture-related. Tree quarters of agriculture-related falls from height accidents happen between June and October. About one fifth of falling occurs in June. During the period 72 (41.6%) of agriculture-related falling are from a tree during the fruit-picking, 68 (39.3%) from a tractor or tractor trailer, 16 (9.2%) while trimming a tree and 17 (9.8%) from other causes (falling from agricultural vehicles or ladders, falling from a height during spraying, etc.). There are 8(4.6%) deaths and 46 (26.6%) severe injuries attributable to the agriculture-related falls from height accidents. Males are more likely to die from a fall. Accidental deaths and severe injuries are most frequent in September 12 (22.2%). Most of the incidents are preventable. Potential risk control measures include improving the availability and using of safety equipment, increasing situational awareness and risk perception, and developing safety culture among farmers and their families. This study allows, for the first time, description and analysis of the falls from height accidents in a city sample of Turkish agriculture sector. It is expected that results of this study may contribute to raise awareness about falling from height injuries. Accident, Agriculture-related falling, Falling from a height; Occupational health, Safety in agriculture. Agriculture plays a significant role in the country’s culture, social life, environment, economy, and employment policy. One of the specific characteristics of this basic sector is unfortunately a poor health and safety conditions. Due to its nature, agriculture is one of the most hazardous sectors in all over the world. Although unreported incidents because of insufficient data report system, the rate of accidents in agriculture is higher than most of other industries. The most common accidents are those involving vehicles, agricultural equipment and machinery, and falls from a height. A fall is defined as an event which results in a person coming to rest inadvertently on the ground or floor or other lower level . Fall is an unexpected  and unintentional or accidental event with or without injury. Fall from height refers to fall from an upper level to another level. Frailty and Injuries: Cooperative Studies of Intervention Techniques (FICSIT) define fall from height as unintentionally coming to rest on the ground, floor or other lower level [3,4]. When a person falls from a height the potential energy (due to the height) is converted to kinetic energy under the influence of gravity . At the moment of impact, the body undergoes deceleration and the amount of kinetic energy transferred to the ground reacts with an equal amount against the body itself. The body in the form of injuries reabsorbs the energy lost . Due to this fact, falls from height are the main cause of deaths for high level works. Agricultural work carries an above-average risk of falling accidents and it is clear that the agriculture sector has the greatest risk of being injured due to a fall from height. Falling from height is also one of the main causes of fatal accidents in agriculture, accounting for many deaths each year. Falls frequently occur in agriculture sector because no precautions are taken, or any equipment that is used is defective, not appropriate, or used incorrectly. Often people about to do a job believe it will ‘only take a few minutes’, and take a risk in the hope that simply being careful will be enough. In Turkey, there is not enough data on the risk of falls from height in the agricultural sector. National data about victims, type and reasons or other specific features of falling from height incidents are unfortunately unknown. In addition, there are no studies in this area specifically addressing falling from height. Due to unavailability of agricultural data bank and lack of researches concerning causes and characteristic of fallrelated accidents, taking preventive measures to reduce the possible risk of injuries is difficult. It is expected that this study contributes to fill a large gap in the literature by examining significant agents involved in agricultural-related falling from high accidents and the frequency and causes of such accidents, between 2007 and 2014 in rural area of Bilecik, Turkey. Falling from a height accidents in rural area of Bilecik were investigated due to incident reports. Totally 673 text of the “falling from a height” accident report was examined. One hundred seventy-three (173) of them were agriculture-related (agriculture / forestry / livestock) which were analyzed with respect to cause, type and time of incident, severity of injury, age and gender of victims, and other factors by using statistical software program (SPSS for Windows, Version 19, SPSS Inc., Chicago, IL, USA). The research included only incidents that occurred on or between January 1st 2007 and December 31st 2014. The study is limited to the rural area of the city. In this study, falls from a height include all falling accidents from any height that occurred as a result of agricultural activity, but exclude slips, stumbles, falls on the same level, fall-related deaths and non-fatal injuries due to assault and intentional self-harm, falls from burning buildings, and falls from a moving vehicle followed by an accident. During the period 2007-2014, 673 “falling from a height” accidents in rural area of Bilecik were occurred. The agriculture sector accounted for 25.7% (173) of falls-related accidents. Seventy five percent (75%) of the agriculture-related “falling from a height” accidents were happened between June and October. About one fifth of falling was occurred in June (Figure 1). Males accounted for about three-quarters of the falls-related accidents. Figure 1: Agriculture-related falling from height accidents by months. Fruit picking is the most prominent work process in falls. Tractor-related works (loading/unloading or transportation) and trimming a tree are the next most significant work processes. Falls from a tree accounts for the largest number of injury. During the period 72 (41.6%) of agriculture-related falling was from a tree during the fruit-picking, 68 (39.3%) from a tractor or tractor trailer, 16 (9.2%) while trimming a tree and 17 (9.8%) from other causes (falling from agricultural vehicles or ladders, falling from a height during spraying, etc.). Figure 2 shows high falls in agriculture according to work process by years. Figure 2: Source of agriculture-related falling from height accidents by years. During the same period, 8 (4.6%) people died following agricultural related a fall from a height. In addition to this, 46 (26.6%) severe injuries with a life-threatening condition occurred attributable to the agriculture-related “falling from a height” accidents. The fatalities and serious injuries represent 31.2% of all agricultural related injuries over this period. Figure 3 shows results of falling from height accidents in agriculture by years. Figure 3: Results of agriculture-related falling from height accidents by years. Falls from a tractor-trailer or tractor fender accounted for the greatest number of fatalities. There may be a high risk of death due to falling during loading and unloading process in agricultural workplaces or agriculture-related transportation. This was followed by falls from tree when fruit picking. This study indicated that all victims of falls from height deaths were male. This study shows that three-quarters of all deaths were among persons ages 65 and older. Forty-five percent of death and severe injuries with a life-threatening condition occurred in individuals aged>60. Of all severe injuries with a lifethreatening condition and deaths, 38% occurred among persons aged 45-59 years and eleven percent among the 14-44 years age group. Approximately 5% of fatal and serious injuries occurred in children aged less than 14 years. Accidental deaths and severe injuries was most frequent in September 12 (22.2%), June 9 (16.6%), August 9 (16.6%), and November 7 (13%). Fatal high level falls in agriculture between 2007 and 2014 by month are shown in figure 4. 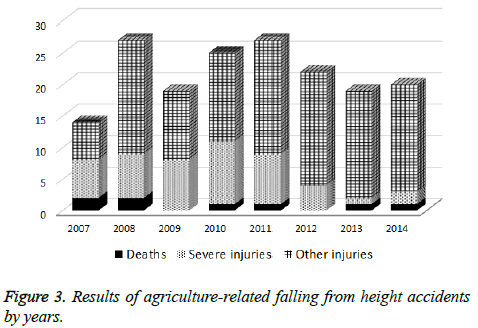 Figure 4: Agriculture-related falling from height accidents that resulted deaths/severe injuries. Accidents in agriculture sector are found to be most common between July and September, the main months for harvesting . But this study shows that due to falls from a tree, June and October, as well as other months have highest accidents rates. Both genders are at risk of falls , but males have a higher rate of falls from height than females . The higher proportion is probably linked to male agriculture workers being more likely to work at height than females. Tractor or tractor fender and tree are major agents leading to deaths due to falls. Other studies support our results that deaths due to falls from trees are one of the leading causes of fatal falls from a high in rural areas [8-12] unlike urban areas . Males were more likely than females to be injured due to falls from tree [11,14-17]. In accordance with the results of this study, in some countries, it has been noted that males are more likely to die from a fall [1,10,18]. Possible explanation of this is that males work higher levels with a risk-taking behavior . Age is one of the key risk factors for falls. Older people have the highest risk of death or serious injury arising from a fall . The number of fatalities involving a fall from height increases with age. Elderly adults over 60 years of age have the most fatal falls as a significant age effect unique to agriculture . According to the results of a study, deaths due to falling from trees were highest in people aged 15-44 years . On the contrary, the present study found that all of the victims of falling from trees were aged 65 and over.The research provides some valuable findings about accident characteristics of agriculture sector in sample of a city. However this study has some limitations. Samples were relatively small and were conducted in specific geographical areas. Therefore, their results are not generalizable at the national level. Not only do falling accidents cause physical injury, they often affect their victims through emotional problems such as anxiety, fear, anger and depression. Most of the accidents are preventable. The main approaches to preventing agricultural accidents are through education and training of the workforce. The effectiveness in reducing accidents of training on safety is uncertain. In addition to education and training programs, prevention strategies should emphasize “creating safer environments, prioritizing fall-related research and establishing effective policies to reduce risk” . Falling from a height usually occur as a result of poor management control and/or risky behaviors rather than because of equipment failure . To effectively minimize the risks of falling from tractor or tree, prevention programs must encourage safer work behaviors and practices as well as using of appropriate safety devices and equipment. There are significant numbers of accidents in the agricultural industry that could be prevented if simple risk control measures were adopted. Potential risk control measures include improving the availability and using of safety equipment, increasing situational awareness and risk perception, and developing safety culture among farmers and their families. Jukka Takala, director of the ILO's safe work programme, says "The sad truth is that in some parts of the world many workers will probably die for lack of an adequate safety culture…. This is a heavy price to pay for uncontrolled development" . This is reality of agriculture rather than other sectors. In order to manage prevention policies and to raise public awareness about the agriculture-related falling accidents, it is important to have accurate and comprehensive information concerning the situations leading to injury. Unfortunately, there are major gaps in the availability of this sort of information, especially on a national scale. This study allows, for the first time, description and analysis of the falls from height accidents in a city sample of Turkish agriculture sector. It is expected that results of this study may contribute to raise awareness about falling from height injuries. The results also will be a valuable reference for researchers concerned with rural safety and health. Lamb SE, Jørstad-Stein EC, Hauer K, Becker C. Prevention of Falls Network Europe and Outcomes Consensus Group. Development of a common outcome data set for fall injury prevention trials: the Prevention of Falls Network Europe consensus. J Am GeriatrSoc 2005; 53: 1618-1622. Masud T, Morris RO. Epidemiology of falls. Age Ageing 2001; 30: 3-7. Vasudeva Murthy CR, Harish S, Girish Chandra YP. The study of pattern of injuries in fatal cases of fall from height. Al Ameen J Med Sci 2012; 5: 45-52. Manson JK. The pathology of trauma. 3rd editions Arnold publication New York 2000. Solomon C. Accidental injuries in agriculture in the UK. Occup Med (Lond) 2002; 52: 461-466. Al B, Yıldırım C, Çoban S. Falls from heights in and around the city of Batman. UlusTravmaAcilCerrDerg 2009; 15: 141-147. Yavuz MS, Tomruk O, Baydar CL, Küpeli A. Evaluation of accidental fall from high cases who admitted to emergency service. J Forensic Med 2004; 18: 8-12. Ozkan S, Duman A, Durukan P, Avsarogulları L, Ipekci A, Mutlu A. Features of injuries due to falls from walnut trees. Turk J Emerg Med 2010; 10: 51-54. Içer M, Güloğlu C, Orak M, Üstündağ M. Factors affecting mortality caused by falls from height UlusTravmaAcilCerrDerg 2013; 19: 529-535. Ersoy S, Sonmez BM, Yilmaz F, Kavalci C, Ozturk D, ErtugrulAltinbilek, FatihAlagöz, FatmaCesur, Ali ErdemYildirim, OzhanMerzukUckun, and Tezcan Akin. Analysis and injury patterns of walnut tree falls in central Anatolia of Turkey. World J EmergSurg 2014; 9: 42. Oguzturk H, Turgut K, Turtay MG, Sarihan ME, Gur A, Beydilli I, Gurbuz S. Apricot tree falls: a study from Malatya, Turkey. Biomed Res 2016; 27: 210-213. Jagnoor J, Suraweera W, Keay L, Ivers RQ, Thakur J, Gururaj G,Prabhat Jha. Childhood and adult mortality from unintentional falls in India. Bull World Health Organ 2011; 89: 733-740. Gupta A, Reeves B. Fijian seasonal scourge of mango tree falls. ANZ J Surg 2009; 79: 898-900. Nabi DG, TakShafaat R, Kangoo KA, Dar Fiaz A. Fracture patterns resulting from falls from walnut trees in Kashmir. Injury 2009, 40: 591-594. Javadi SA, Naderi F. Pattern of spine fractures after falling from walnut trees. World Neurosurg 2013, 80: 41-43. Negin J, Vizintin P, Houasia P, Martiniuk AL. Barking up the wrong tree: injuries due to falls from trees in Solomon Islands. Med J Aust 2014; 11: 698-700. Majdan M, Mauritz W. Unintentional fallrelated mortality in the elderly: comparing patterns in two countries with different demographic structure. BMJ Open 2015; 5: e008672.